"This is great with any tacos. My mother-in-law is from Mexico and showed me how to make this. I only added a few more things to make it better." Place the tomatillos, serrano peppers, onion, and garlic in a saucepan, and add water to just cover. Sprinkle the salt over the top, bring to a boil, reduce the heat to medium-low, and cook until the tomatillos are soft and have turned slightly brownish in color, 20 to 30 minutes. Add more water if needed to keep the mixture from burning as it cooks. Pour the cooked vegetables into a blender, and blend until smooth. 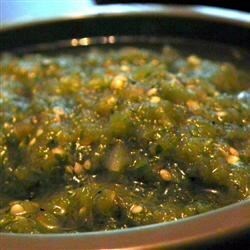 great and simple salsa verde! the only regret i have is that i didn't scale up the size from the original recipe. warning: once you start eating this, it's almost impossible to stop!